LIC Transaction Status: After Lic premium payment through online everyone wants to check the Lic transaction status. For that Life Insurance Corporation of India has provided the facility to check LIC online payment transaction status through online. You can see the Lic payment transaction status immediately after online premium payment. Checking Lic transaction status is the simple procedure where it takes just a few minutes. The only thing you have to do is follow the below-given steps and enter your lic Policy number and transaction date to check lic transaction status. LIC Online payment is the easy and fast method to pay your premiums online. Many of the policyholders don’t know the procedure to pay their premiums online. So, they will go the nearest branch office to pay dividends. Those who don’t know the steps for online premium payment, please refer LIC Online Payment. In this, we have given the easy steps to be followed during Online payment. So that make it easy to pay premiums. Once the premium has been paid through online, LIC of India provides electronically generated a receipt for your payment through online. It will be mailed to your E-mail ID (which has been registered / which you have provided for online payment). You will receive the mail within 3 days of the online payment being done. As it is taking 3 days, you can also check lic transaction status by visiting Lic of India official website www.licindia.in. The steps to be followed are given below. Visit Official website of Lic of India www.licindia.in. 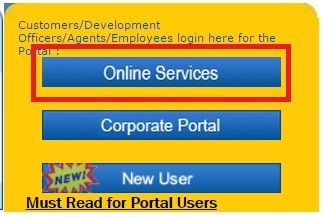 Click the ‘Online Services’ which is at the right side of the homepage that is shown below. After clicking on the Online Services. Then the page with ‘Registered User’ and ‘LIC PayDirect’ will be displayed as shown below. Now, click on the ‘LIC Pay direct’ button. The page showing Online Premium Payment and Transaction Status will be displayed as shown below. On clicking the ‘Transaction Status’ link, you will be brought to the below-shown page. In that columns, enter your Policy Number and Transaction date in the given format dd/mm/yyyy. Finally, click on ‘Submit’ button. 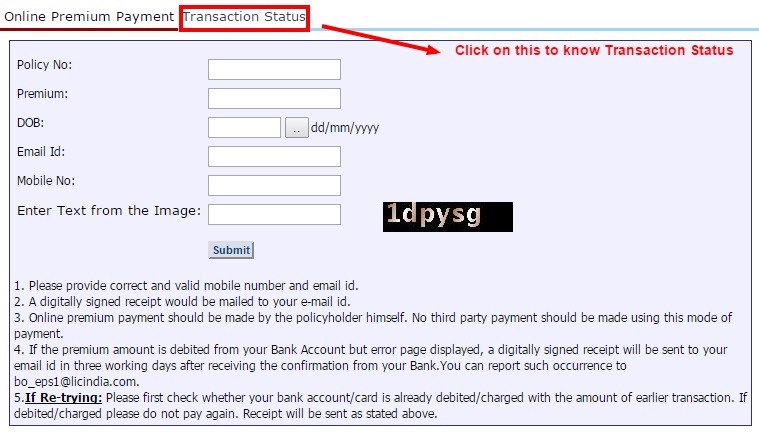 So that your Lic Transaction Status/details will be displayed. KINDLY EMAIL ME ([email protected]) POLICY NO- 922249224 , 419868384 , 998308902 AND 413735840 ALL STATUS AND PLEASE SMS 9874200012 OF PAYMENT STATUS EACH AND EVERY ECS PAYMENT. In children money back policpolicye ( 113-23),while claiming maturity benefit whether to furnish details of Life Assured or Life Proposer?